IPE (pronounced EE-pay) is the finest quality wood decking material available from the Atlantic City Boardwalk, to Las Vegas Treasure Island Resort, to your own backyard. Nothing keeps its integrity or lasts as long as IPE Decking. IPE is an exotic hardwood that is naturally resistant to rot and decay. Is 8 times harder than California Redwood. 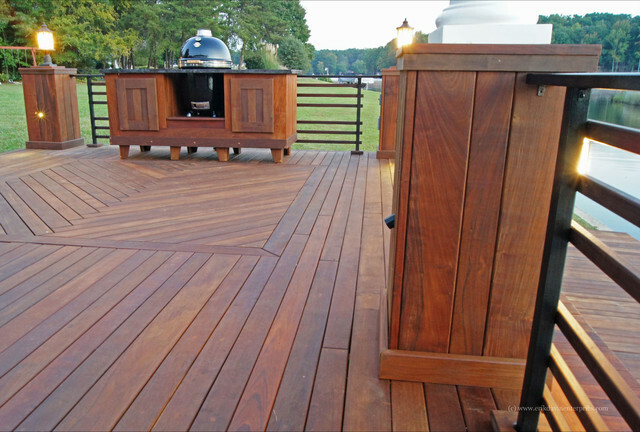 Our IPE Decking is responsibly harvested from well-managed forests to provide a truly renewable resource. IPE has many benefits over teak and is available at a fraction of the cost. Decks manufactured from IPE can last 40 years or longer easily outperforming treated softwood. IPE is air seasoned for dimensional stability. Wood movement is minimal after proper acclimation at the construction site. IPE can be finished with penetrating oil or left natural to age to a silver patina. A yearly cleaning and occasional reapplication of oil will keep your deck beautiful for many years. IPE has a class A fire rating. IPE is available in 1" x 6” (3/4 x 5 1/2 net). Random lengths from 8' to 20' feet.